The soil bacterium Pseudomonas putida KT2440 is a “generally recognized as safe”-certified strain with robust property and versatile metabolism. Thus, it is an ideal candidate for synthetic biology, biodegradation, and other biotechnology applications. The known genome editing approaches of Pseudomonas are suboptimal; thus, it is necessary to develop a high efficiency genome editing tool. In this study, we established a fast and convenient CRISPR–Cas9 method in P. putida KT2440. Gene deletion, gene insertion and gene replacement could be achieved within 5 days, and the mutation efficiency reached > 70%. Single nucleotide replacement could be realized, overcoming the limitations of protospacer adjacent motif sequences. We also applied nuclease-deficient Cas9 binding at three locations upstream of enhanced green fluorescent protein (eGFP) for transcriptional inhibition, and the expression intensity of eGFP reduced to 28.5, 29.4, and 72.1% of the control level, respectively. Furthermore, based on this CRISPR–Cas9 system, we also constructed a CRISPR–Cpf1 system, which we validated for genome editing in P. putida KT2440. In this research, we established CRISPR based genome editing and regulation control systems in P. putida KT2440. These fast and efficient approaches will greatly facilitate the application of P. putida KT2440. Pseudomonas putida KT2440 is an environmentally safe, non-pathogenic Pseudomonad species . Because of its outstanding capacity to degrade aromatics compounds and robust viability in harsh conditions, P. putida KT2440 is an ideal chassis for bioremediation , metabolic engineering , and biocatalysis . Several genome editing approaches have been applied into Pseudomonas. A series of molecular tools, such as counter-selection markers (sacB , pyrF , upp ), heterologous recombinases (Cre-loxP , Flp-FRT ), and suicide vectors  have been validated and spurred the advancement of allelic exchange for engineering mutations in this genus. Bacteriophage-based recombination proteins (Red/ET , λ-Red [12, 13]) enable homologous recombination between a target genome locus and donor DNA, which is an efficient method in Pseudomonas aeruginosa PAO1  and P. putida KT2440 [11, 13]. Based on homologous recombination in double-stranded breaks (DSB), the I-SceI homing endonuclease has been developed as a seamless genome editing tool in P. putida KT2440 . In another chromosomal engineering approach used in Pseudomonas, transposon vectors-based methods [15–17] have excellent transposition frequencies. Although these various strategies have been applied into genome engineering of Pseudomonas, they still have many drawbacks, such as time-consuming manipulation, scars left in the genome, inability to target exact loci, difficulty in generating mutants, and deficiency in plasmid-curing. Clustered Regularly Interspaced Short Palindromic Repeats (CRISPR)-Cas (RNA-guided proteins) systems are a prokaryotic adaptive immune defense mechanism in many bacteria and most archaea . Among three major types, the type II CRISPR–Cas system from Streptococcus pyogenes (SpCas9) is the best characterized . In the CRISPR–Cas9 system, a chimeric single guide RNA (sgRNA) is used for Cas9 sequence-specified guidance , and a short protospacer adjacent motif (PAM) exerts recognition between Cas9 and the target DNA . Cas9 protein then catalyzes the breaking of DNA double strands . The DSB caused by Cas9 can be repaired via homology-directed repair (HDR)  or non-homologous end joining (NHEJ)  in eukaryotes. Cas9-nickase (nCas9), in which one domain is inactivated (D10A or H840A variant), can reduce the lethal effect on cells and the repairing process can occur more easily [25, 26]. A nuclease-deficient Cas9 (dCas9) retains sgRNA binding ability and can be applied for target gene regulation, including blocked transcription for CRISPR-based interference , or fused with activators for RNA-guided activation . Because of its marker-free, cost-efficient, simple genome manipulation, the CRISPR–Cas9 system has been developed as a genome engineering tool in a wide range of prokaryotes and eukaryotes, including (but not limited to) Escherichia coli , Clostridium cellulolyticum , Streptomyces species , Bacillus subtilis , Yarrowia lipolytica , Saccharomyces cerevisiae , mammalian cells , and zebrafish . Recently, Aparicio et al. developed a CRISPR/Cas9-based three-plasmid system in P. putida, and gene deletion or single nucleotide substitution can be achieved. However, this three-plasmid system has challenges regarding plasmid-curing, especially for continual genome editing, and other versatile characteristics of type II CRISPR system have not been fully explored in P. putida KT2440. Cpf1 is a newly discovered single RNA-guided nuclease  that belongs to type V-A CRISPR systems . In contrast with the chimeric sgRNA-associated Cas9, in the CRISPR–Cpf1 system, Cpf1 recognizes ‘TTN’ PAM sequence. The PAM sequence is located at the 5′- end of the target sequence, and the spacer sequence follows a 19-nt CRISPR RNA (crRNA) direct repeat. Aside from the different recognition mechanism compared with Cas9, the staggered cutting style of Cpf1 could facilitate gene insertion for NHEJ repair mechanisms . Taken together, these characteristics make CRISPR–Cpf1 an attractive complementary tool to the well-established CRISPR–Cas9 system. Because of the versatile functions and simple manipulation of CRISPR–Cas9, we developed a CRISPR–Cas9 based genome editing system to overcome major limitations of the known gene editing technologies of P. putida KT2440. Here, we tested Cas9 toxicity and analyzed sgRNA off-target effect; multiple genes were targeted for integration or deletion by our two-plasmid system. Catalytically inactive Cas9 (dCas9) was applied to control gene expression via transcriptional repression. Additionally, we preliminarily explored the CRISPR–Cpf1 system for genome editing in P. putida KT2440. These systems could be powerful tools to extend the application of P. putida KT2440, and pave the way for use of CRISPR systems into other Pseudomonads. The strains and plasmids used in this study are given in Additional file 1. All kinds of E. coli, and P. putida KT2440 were grown in LB medium (Liquid and Solid). E. coli DH5α was used for all cloning and maintenance, while E. coli S17-1 served as a helper strain for conjugal transfer. E. coli were grown at 37 °C, and P. putida KT2440 was incubated at 30 °C. Antibiotics were added at the following concentrations: kanamycin, 150 μg/mL (50 μg/mL for E. coli); gentamicin, 50 μg/mL; tetracycline, 25 μg/mL (15 μg/mL for E. coli) and spectinomycin, 100 μg/mL. The DNA polymerase PrimeSTAR® Max, all restriction endonucleases and T4 DNA ligase were purchased from Takara Bio Inc (Dalian, China). The One Step Cloning Kit (Vazyme Biotech Co., Ltd, Nanjing, China) and pEASY-Uni Seamless Cloning and Assembly Kit (TransGen Biotech, Beijing, China) were applied for seamless cloning. The CRISPR/Cas9 system consists of two plasmids: pCAS-RK2K and pSEVA-gRNAT (Fig. 1). Plasmid pCAS-RK2K was constructed from plasmid pCASsac (an unpublished E. coli CRISPR/Cas9 2.0 system), which was a gift from Yang Sheng. Plasmid pSEVA-gRNAT was derived from pTargetF  and pSEVA644, the latter together with its same series of plasmids was obtained from SEVA Database . All primers used in this study are listed in Additional file 2. Based on pCAS backbone , the construction of pCASsac focused on the following steps: a tightly-controlled Rhas-PrhaB promoter replaced with lacIq-Ptrc promoter; pSC101 replicon as a substitute for the temperature-sensitive replicon repA101 (Ts); SacB acted as a curing component was inserted into the plasmid. In our study, two broad-host-range replicons, RK2 (together with oriT fragment) from pSEVA429 and pBBR1 from pBBR1MCS2 were amplified using primers Sa-RK-1F/Sa-RK-2R and Sa-BBR1-1F/Sa-BBR1-2R, respectively. The replication origin of pCASsac was then replaced with RK2 or pBBR1 using the One Step Cloning Kit (the detailed construction strategies are shown in Additional file 3), thus creating plasmids pCAS-RK2K and pCAS-pBBR1 (Fig. 1a), respectively. pCAS-RK2K has a tetracycline version: pCAS-RK2T (the kanamycin resistance marker in pCAS-RK2K was replaced with a tetracycline resistance marker). Elimination of Cas9 or λ-Red inducible expression system from pCAS-RK2K respectively, pCAS-RK2K△Cas9 and pCAS-RK2K△Red were constructed via Gibson assembly with primers QC-1F/QC-1R, XC-2F/XC-2R and JH-1F/JH-1R, JH-2F/JH-2R, JH-3F/JH-3R. Plasmid pSEVA-gRNAT (Fig. 1b) was assembled from the following fragments: LacIq-ptrc promoter was removed from pSEVA644, and then pSEVA644△LacIq-ptrc was used as backbone; j23119 promoter and sgRNA cassette from pTargetF were fused into the EcoRI/SacI digested pSEVA644△LacIq-ptrc via primers JS-1F/JS-2R. We selected nicC (Locus tag is PP_3944) as target site, which is an unessential gene in the P. putida KT2440 genome. pSEVA-gRicF was derived from pSEVA-gRNAT by replacing the original N20 sequence with ‘AAAATCGCAATCGTCGGTGC’ via inverse PCR using primers NC-F/NC-R. The homologous arms of nicC were acquired from the Pseudomonas Genome Database . Next, 500 bp length upstream and downstream of the target gene were amplified using primers NT-1F/NT-2R, NT-ZF/NT-ZR, and connected via overlap-extension (SOE) PCR. The resulting homologous arm was then inserted into the BamHI/HindIII-digested pSEVA-gRicF, thus creating pSEVA-gRicT. Here, the N20 sequence of low off-target rate was designed via CasOT . N20 sequences of all pSEVA-gRNAT derivatives were constructed by two reverse primers with 20 nt reverse complementarity. The repairing homologous arms were ligated into pSEVA-gRNAT by BamHI and HindIII sites or using Gibson assembly. Toward different DNA template strand of nicC (PP_3944), pSEVA-gRic6T and pSEVA-gRic5T were constructed from pSEVA-gRicT via primers Nic6F/Nic6R and Nic5F/Nic5R, respectively. The target-specificity of pSEVA-gRic6T and pSEVA-gRic5T was calculated by CasOT. Due to its specificity in the genome, the N20 sequence (‘CATTCAGAACTAACTTGTCG’) was inserted into pSEVA-gRNAT via primers DgRNA-F/DgRNA-R, thus creating pSEVA-dgRNA. pSEVA-dgRNA was designed as a positive control. The sequence ‘GGTTGTAGGAAGATTCGATA’ from pSEVA-gRNAT replicon (pRO1600) was selected as N20 sequence under the transcriptional control of rhamnose-inducible promoter (Rha), in which pCAS-RK2K was applied to cure pSEVA-gRNAT. All of the N20 sequences designed by CasOT and primers used for pSEVA-gRNAT derivatives are listed in Additional files 2 and 4. Plasmid pCAS-pBBR1, pCAS-RK2K, pCAS-RK2T, pSEVA-gRNAT or other derivatives was transformed into P. putida KT2440 by electroporation. Firstly, KT2440 was inoculated and cultivated overnight, then transferred to a 100 mL flask containing 10 mL LB without antibiotics until cell densities (OD600) reached 0.6–0.8. After concentration, the electrocompetent cells were prepared by three times washing of 3 mM HEPES Buffer , then concentrated to 500 µL. For electroporation conditions, 100 µL bacterial suspension and 150 ng DNA were transferred to a 2 mm gap ice-cold electroporation cup and the detailed setting of Bio-Rad GenePulser II were listed as follows: 2.5 kV; 200 V; 25 uF. After electroporation, 1 mL LB liquid medium was added and mixed, then the entire mixture was transferred into a 2.0 mL Eppendorf tube and cultivated in 30 °C for 2 h before being spread on LB selection plates. Alternatively, E. coli S17-1 could be used as a helper strain to transfer pCAS-RK2K or its derivatives into P. putida KT2440. E. coli S17-1 containing plasmid (adding related antibiotics), and Pseudomonas species were cultivated in LB medium overnight, then each bacteria was transferred to a 5 mL LB tube (without antibiotics) for incubation until the OD600 reached 0.6–0.8. All these cells were concentrated and washed four times with sterile water, then E. coli mixed with Pseudomonas in a ratio of 1:1. Next, these mixtures were dripped on LB agar plates in small dots, and incubated at 37 °C for 6 h, then shifted to 30 °C overnight. After incubation, the mixture cells were scraped from the plate, and diluted and spread on selection plates (Tetracycline 25 μg/mL or kanamycin 150 μg/mL, together with spectinomycin 100 μg/mL) for 12–16 h at 30 °C. As the catalytic activity of Cas9 influences its toxicity in several prokaryotic microbes, we constructed four versions of Cas9 by introducing point mutations at the D10A, H840A, D10A and H840A together, as well as frameshift mutation in the start codon by transforming ATG to AGTG (Cas9FM) via primers PDF1F/PDF1R, PDF2F/PDF2R, and PDFM-1F/PDFM-1R, respectively. Each Cas9 derivative was assembled into pCAS-RK2K△Cas9, creating the following plasmid pCAS-RK2K-nCas9D, pCAS-RK2K-nCas9H, pCAS-RK2K-dCas9, and pCAS-RK2K-Cas9FM. In this experiment, pCAS-RK2K was used as a control. Using the same electroporation conditions, 150 ng of these plasmids were transformed into P. putida KT2440 in respective triplicate, and then screened by kanamycin plates. After cultivated at 30 °C for 18 h, the average number of transformants was calculated as CFU/μg of DNA. In this two-plasmid system, large size plasmid pCAS-RK2K or pCAS-RK2T was first transformed into P. putida KT2440 by electroporation or conjugal transfer. After preparation of KT2440 harboring pCAS-RK2K or pCAS-RK2T, candidate colony was inoculated in LB liquid medium and cultivated overnight. Then overnight culture was transferred into 10 mL tube by 4%, and 0.6% l-arabinose (0.06 g in 10 mL LB liquid) was added into the medium and completed cultivation about 2–2.5 h. The bacteria cells were then harvested and washed by 3 mM Hepes Buffer , and finally concentrated to 500 μL for electroporation. Using the electroporation protocols described above, 150 ng of pSEVA-gRNAT or its derivatives was added. After the recovery process, 100 μL final concentrated cells were plated on selection plates (Tetracycline 25 μg/mL or kanamycin 150 μg/mL, together with gentamycin 50 μg/mL) and cultivated at 30 °C. Transformants were analyzed by colony PCR and confirmed by DNA sequencing. In order to investigate the deficiency effect of four essential sections (Cas9, gRNA cassette, homologous repairing template, and λ-Red system) in this system, we designed a series of control experiment to calculate the total CFU and analysed the mutation efficiency. Plasmid pCAS-RK2K, pCAS-RK2K△Cas9 and pCAS-RK2K△Red (plasmid construction see above) were first transformed into P. putida KT2440, respectively. After KT2440 harboring the related pCAS-RK2K or its derivatives, pSEVA644, pSEVA-dgRNA, pSEVA-gRic6T, and pSEVA-gRic6F (derived from pSEVA-gRic6T by deletion of homologous repairing template) were sequential transformed into these strains, respectively (see below Fig. 3a). After the identification procedure, the mutated colony was inoculated into a 5 mL LB medium with kanamycin (150 μg/mL) or tetracycline (25 μg/mL) plus rhamnose (10 mM) and shaken at 30 °C overnight. Subsequently, the colonies were streak on LB selection plates containing kanamycin (150 μg/mL) or tetracycline (25 μg/mL), and confirmed as pSEVA-gRNAT lost by colony PCR via primers PS1/PS2. After the first round of genome editing, the pSEVA-gRNAT cured strain could be used in the next round of genome editing. Finally, a plasmid-cured colony was obtained by cultivated overnight with glucose (5 g/L), then diluted and streak in LB agar plates adding sucrose (10 g/L) and glucose (5 g/L). The curing of pCAS-RK2K was confirmed by colony PCR via primers Ra-JF/Ra-JR or identified its antibiotics sensitivity. The construction of single nucleotide mutation in the genome can be divided into two strategies. In the first strategy, single nucleotide mutation aimed to change the PAM sequence (a 3-nt upstream of N20 sequence for pSEVA-gRic6T), the nucleotide sequence ‘CGG’ to ‘CAG’ within nicC gene. We amplified the first 500 bp of nicC and its upstream 500 bp length sequence from genome by primers NCD1F/NCD2R. Based on pSEVA-gRic6T backbone, we assembled the fragment into the plasmid (creating pSEVA-gRic6PAM1) via Gibson assembly and then site-directed mutation in ‘CGG’ was performed by primers NPAM-F/NPAM-R, generating pSEVA-gRic6PAM2. After electroporation of pSEVA-gRic6PAM2 into KT2440 harboring pCAS-RK2K, the mutated colonies were amplified via identification primers D1-JF/D1-JR and confirmed by DNA sequencing. In another strategy, we attempted to mutate ‘CAA’ to ‘CTA’ at position Gln139 in nicC gene. We developed a scarless two-step single nucleotide mutation strategy (Additional file 5). Firstly, we added 20 bp sequence ‘ATGTCTCATAAGATCATTAC’ (named A20 sequence and off-target should be avoided) between N20 sequence of pSEVA-gRic6PAM1 and its PAM sequence via inverse PCR using primers A20F/A20R. After the construction process and gene sequencing, we mutated the target single nucleotide on the homologous arm using primers Nic-SF/Nic-SR, thus creating pSEVA-NicA20. Another plasmid pSEVA-NicA21 was derived from pSEVA-NicA20 by deletion of A20 sequence in homologous arms and replaced the original N20 sequence with A20 sequence using primers NT20-F/NT20-R and NT21-F/NT21-R, respectively. After the first-step editing process, pSEVA-NicA20 was cured from the colony and another plasmid pSEVA-NicA21 was then transformed in the second step. Finally, the mutated colonies were confirmed by DNA sequencing. A catalytically deficient Cas9 was achieved by point mutations at two domains (D10A and H840A). For analysis of gene repression by dCas9, the relative fluorescence intensities of enhanced green fluorescent protein (eGFP) were measured by microplate reader (Thermo Varioskan™ LUX). J5 constitutive promoter  controlled eGFP expression, and the ribosome binding site (RBS site) was designed by RBS Calculator . The dCas9 repression system consists of pCAS-ZE and pSEVA-eGFP. pCAS-ZE was derived from pCAS-RK2K-dCas9. For construction of pCAS-ZE, kanamycin marker was replaced with tetracycline marker, and the λ-Red inducible expression system was eliminated from the backbone, and the N20 sequence was replaced with new sequence, targeting J5 promoter or RBS sites of eGFP. pSEVA-eGFP was assembled by connecting eGFP expression cassette with the AvrI/EcoRI digested pSEVA644. In the eGFP expression element, a ribosome RNA binding site (5′-GCGAGCGCGATCATTCTATTAGGGAGGGAGGT-3′) was located between J5 promoter and fluorescent protein eGFP. According to CasOT, the original N20 sequence of pCAS-ZE was replaced with three new sites (by primers ZEJ-15F/ZEJ-15R, ZEJ-30F/ZEJ-30R and ZEJ-102F/ZEJ-102R respectively), and these plasmids were named as pCAS-ZE1, pCAS-ZE2, pCAS-ZE3 respectively. Another N20 sequence (TGGATCGACCTTCGTACGAG) was cloned into pCAS-ZE0 via primers ZE-J5F/ZE-J5R, which was used as the positive control. Pseudomonas putida KT2440 was selected as the negative control. After transformation of these plasmids into P. putida KT2440 as the protocol described above, the candidate strain was screened in tetracycline and gentamycin plates and identified by the colony PCR. Next, these strain were incubated in LB medium with appropriate antibiotics, and added 10 mM rhamnose for the induction expression of gRNA cassette. Then related cells were harvested until OD600 reached 0.6–0.8. Using the eGFP excitation wavelength at 480 nm and fluorescence emission at 510 nm, a 200 μL of undiluted cultivated cells was added into the 96-well microtiter plates and measured the absolute fluorescence intensity (AFI) and cell density (OD600) by microplate reader. Finally, the fluorescence repression effect was reflected from the relative fluorescence intensity (RFI). To generate CRISPR–Cpf1 system, firstly, the codon optimized FnCpf1 gene (from Francisella novicida) was cloned from pJYS1Ptac  (offered by Yang Sheng) by primers pCf-1F/pCf-2R, and then Cpf1 fragment was cloned into pCAS-RK2K△Cas9 by Gibson assembly via primers pCf-2F/pCf-3R and pCf-3F/pCf-1R, resulting in pCpf1-RK2K. The 23 nt DNA sequence ‘AGGCGCAGGGCCGCTTCTTTGAG’ in pRO1600 replicon (pSEVA-gRNAT derivatives) was selected as target-curing site, which was assembled into pCpf1-RK2K (controlled by rhamnose-inducible promoter). In this FnCpf1 genome editing system, PP_3361 and PP_5301 were selected as target sites. Although FnCpf1 (5′ end ‘TTN’) and SpCas9 (3′ end ‘NGG’) recognize different PAM sequence, the repairing template can be the same donor DNA. Based on the backbone of pSEVA-gR3361T and pSEVA-gR5301T, we eliminated original Cas9-sgRNA sequence and added candidate Cpf1-crRNA into these plasmids via inverse PCR. To this end, pSEVA-gcR3361T and pSEVA-gcR5301T were constructed using primers 361-Cpf1F/361-Cpf1R and 5301-Cpf1F/5301-Cpf1R. In this CRISPR–Cpf1 genome editing system, pCpf1-RK2K was first transformed into P. putida KT2440 by conjugal transfer. After KT2440 harboring pCpf1-RK2K, crRNA plasmids were transformed into this strain by electroporation. pSEVA-gR3361T or pSEVA-gR5301T was selected as a control, which was introduced into KT2440 with an equal amount of DNA (150 ng). The related electroporation conditions, genome editing process, and plasmid curing method were consistent with above CRISPR–Cas9 system. Various CRISPR/Cas9 systems have been established in several common microorganisms. Taking the CRISPR/Cas9 system in E. coli as example, it can be divided into a one-plasmid system , a two-plasmid system [29, 47] and a three-plasmid system . Considering plasmid construction and the need for multiple genome editing rounds, we developed our system as a two-plasmid system. The E. coli CRISPR/Cas9 version 2.0 system developed by Jiang (unpublished) is a typical two-plasmid system that consists of several common inducible expression systems (e.g. araBAD expression system and rhaBAD expression system) and antibiotics markers used in Gram-negative bacteria. This system has also been extended into Tatumella citrea DSM 13699 . Since Pseudomonas and E. coli are both γ-proteobacteria, many promoters and antibiotics markers share similar functions in these species. We therefore endeavored to develop a P. putida CRISPR/Cas9 two-plasmid system from Jiang’s E. coli CRISPR/Cas9 version 2.0 system. Firstly, we replaced the replicon of pCASsac with a broad-host-range replicon (pBBR1 or RK2), creating pCAS-pBBR1 and pCAS-RK2K (Fig. 1a), respectively. To prevent sucrose to be catalyzed by SacB, we prepared electrocompetent cells with 3 mM HEPES buffer  instead of 300 mM sucrose . In the first step, we endeavored to introduce plasmid pCAS-RK2K or pCAS-pBBR1 into KT2440. After electroporation, we could not obtain a pCAS-pBBR1 transformant. Although we identified P. putida KT2440 colonies harboring pCAS-RK2K, the electroporation efficiency of this plasmid was low. Toxicity of Cas9 has been reported in several bacteria [30, 45, 50], it was essential to understand whether the low transformation efficiency was caused by Cas9 toxicity, or low electroporation efficiency. 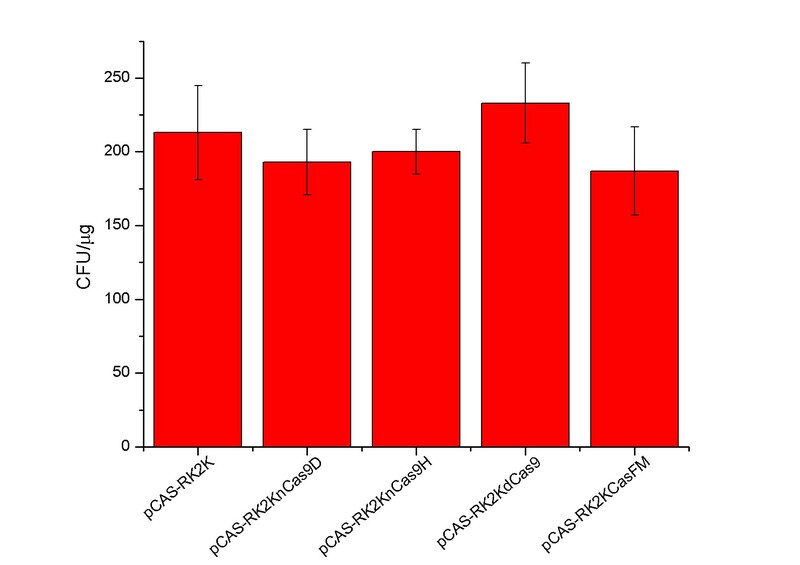 Using the same electroporation parameters and an equal amount of DNA (150 ng), a series of Cas9 versions (pCAS-RK2K-nCas9D, pCAS-RK2K-nCas9H, pCAS-RK2K-dCas9, and pCAS-RK2K-Cas9FM) in pCAS-RK2K were respectively transformed into P. putida KT2440. As we know, different Cas9 mutation versions perform different cleavage effect or cannot cut DNA strand. In this study, different Cas9 versions made little difference to the numbers of the colony-forming units (CFU) obtained (Additional file 6). Therefore, we assumed that the low transformation efficiency obtained in the pCAS-RK2K electroporation experiments was due to low electroporation efficiency, not the lethality of Cas9. In the alternate approach, for pCAS-RK2K and its derivative plasmids, we could obtain a higher transformation efficiency by conjugation. Because the AadA proteins in Pseudomonads can degrade spectinomycin, we could use spectinomycin for the selection of P. putida KT2440 transconjugants [51, 52]. After generating P. putida KT2440 harboring pCAS-RK2K, we investigated whether Cas9 could be guided by sgRNA. We selected a non-essential gene (nicC) as the target site, and created pSEVA-gRicF and pSEVA-dgRNA. As Fig. 2a shows, almost no cells survive RNA-guided cleavage of the Pseudomonas genome (pSEVA-gRicF plate), but some colonies grew when Cas9 was guided by an untargeted sequence (pSEVA-dgRNA plate). However, after addition of homologous repairing arm in pSEVA-gRicT, almost no colonies could survive on the selection plates. From these results, we ascribed cell death to the off-target effects of sgRNA. Calculating the similarity between the KT2440 genome and N20 sequences of pSEVA-gRicT via CasOT, we observed that the N20 sequence was not specifically targeted to the nicC gene, and there were similar sequences at different locations in the genome (Additional file 7). A specific N20 sequence was designed by CasOT  and inserted into pSEVA-gRicT to generate pSEVA-gRic6T (N20 sequence targeted to DNA template strand). After transformation, we obtained dozens of colonies (Fig. 2a, pSEVA-gRic6T plate) and the mutation rate was 100% in 10 randomly picked strains (Fig. 2c, d). Thus, this result indicated that target gene could be mutated via our CRISPR–Cas9 system. To understand the relevance of four components—Cas9, the gRNA cassette, the homologous repairing arm, and λ-Red system—in our CRISPR/Cas9 system, we systematically constructed and transformed a series of plasmids into six groups to assess the connections among and requirements for these elements. Based on the research above, nicC was selected as the target site in this experiment. Based on total numbers of CFUs (Fig. 3), when Cas9 alone was introduced with pSEVA644 (Fig. 3a-I) or a non-target gRNA (Fig. 3a-III), we obtained a large number of transformants. Testing an otherwise intact CRISPR/Cas9 system without Cas9 protein (Fig. 3a-VI), the number of colonies was slightly higher than for the two previous groups, indicating that the presence of Cas9 may exert slight cell toxicity or decrease the electroporation efficiency of small plasmids. Next, without the heterologous repairing ability provided by the λ-Red system (Fig. 3a-II, IV), we found cells hardly survived the Cas9-induced DSBs using their endogenous repairing system, even on addition of a homologous repairing template (Fig. 3a-IV). In conclusion, only when the CRISPR/Cas9 system contains its four essential components (Fig. 3a-V) could efficient genome editing be achieved. To further investigate the utility of CRISPR/Cas9 system in P. putida KT2440, we performed different genomic modification approaches in nicC gene site (Table 1). Firstly, it is essential to know the effect of N20 sequence targeting different DNA template strand. We designed pSEVA-gRic5T, which was a plasmid with a new N20 sequence targeting the DNA non-template strand. After electroporation of pSEVA-gRic5T, we picked 15 colonies from plates and found that the mutation rate reached 93.3%. Thus, for the same target gene, a similar high mutation rate was observed when either DNA strand was targeted. Meanwhile, we also examined gene replacement of DNA fragment of three different lengths of (Table 1). All these fragments were respectively inserted between the upstream and downstream homologous arm of pSEVA-gRic6T, and transformed into P. putida KT2440 harboring pCAS-RK2K using genome editing protocols described above. These insertions all showed a high knock-in rate (Table 1), which indicated that the length of the inserted fragment (within the range we tested) did not decrease the mutation rate. In addition, we achieved single nucleotide mutation (SNM) in nicC gene, by changing the PAM sequence ‘CGG’ to ‘CAG’ via pSEVA-gRic6PAM2 (Table 1). Nevertheless, except for the PAM position, the editing of PAM unavailability sites was not so simple . In order to achieve single nucleotide mutation for PAM unavailability sites, we need to select an ideal N20 sequence which can satisfy both non-off-target in genome and silent mutation (avoid repairing template degradation) will not change amino acid sequence. Next, we attempted to modify the Gln139 in nicC gene to Leu139 by mutating the codon ‘CAA’ to ‘CTA’. In this experiment, we established a scarless two-step replacement strategy for SNM (Additional file 5), thus making a silent mutation in repairing template was not required. An A20 sequence was designed to insert between the N20 sequence and the PAM motif in pSEVA-gRic6PAM1, and this operation could result in replacement of the PAM motif of the original N20 sequence with the A20 sequence. In the first-step editing process, the target nucleotide was mutated and the A20 sequence was inserted into the genome (Fig. 4b). Next, after curing of the pSEVA-NicA20, the A20 sequence was eliminated from the genome by transformation with pSEVA-NicA21. Finally, the single nucleotide mutation was retained in the target site (Fig. 4c). Aside from these versatile mutations of nicC gene, nine other target sites, PP_0552, PP_3361, PP_3733, PP_3889, PP_3939–PP_3940, PP_3947–PP_3948, PP_1706, PP_3846 and PP_5301, were used to further examine the mutation rate of the CRISPR/Cas9 system. PP_0552, PP_3361, PP_3733 and PP_3889 were selected as genome editing sites in KT2440 harboring pCAS-RK2K. After transformation of pSEVA-gRNAT derivative plasmids (pSEVA-gR0552T, pSEVA-gR3361T, pSEVA-gR3733T and pSEVA-gR3889T) into KT2440 harboring pCAS-RK2K, we obtained high mutation rates in every case. The resulting mutation efficiencies for PP_0552, PP_3361, PP_3733 and PP_3889 were 80% (8/10), 84.6% (11/13), 100% (18/18) and 91.6% (11/12), respectively. Having demonstrated the mutation efficiency of KT2440 harboring pCAS-RK2K, the utility of pCAS-RK2T (tetracycline version) was examined in another five sites (PP_3947-PP_3948, PP_3939-PP_3940, PP_3846, PP_1706 and PP_5301). After electroporation of pSEVA-gR3947-3948T into KT2440 harboring pCAS-RK2T, all eighteen mutant clones were proved to be successful editing. In the case of PP3939-PP3940, nine out of ten transformants were mutated. When pSEVA-gR3846T was introduced into KT2440 containing pCAS-RK2T, the editing efficiency of PP_3846 was 100% (10/10), similar to the frequency (18/18) obtained from PP_3947–PP_3948 mutation experiment. For PP_1706 and PP_5301, the colony PCR indicated that mutation efficiencies of 93.7% (15/16) and 100% (10/10) were generated in relevant experiment. Comparison of the deletion rate at the nine different locations is given in Table 1. The mutation rate varied between sites, but the editing efficiency overall was high. To expand the function of our CRISPR/Cas9 system, we endeavored to establish a CRISPR interference (CRISPRi) system in P. putida KT2440. In CRISPRi, a nuclease deficient Cas9 (dCas9) can be guided by a sgRNA or multi sgRNAs to exert transcriptional repression upstream of target genes. Without its endonucleolytic activity, dCas9 remains bound to the target locus; this has been validated for regulation of gene expression in several organisms [27, 28, 50]. We attempted to demonstrate a CRISRPi effect via the expression intensity of enhanced green fluorescent protein (eGFP) in pSEVA-J5-eGFP (Fig. 5a). Three sgRNAs targeted to different loci of eGFP transcription were designed and inserted into pCAS-ZE1, pCAS-ZE2, and pCAS-ZE3 respectively (Fig. 5b). After two-step electrotransformation or co-electrotransformation, KT2440 harboring dCas9 and eGFP was screened and incubated in LB medium containing antibiotics and rhamnose. After overnight cultivation, the cell concentration (OD600 nm) and the absolute fluorescence intensity (AFI) were measured simultaneously in a microplate reader. The final fluorescence repression results were evaluated in terms of relative fluorescence intensity (RFI) (Fig. 5d), which was calculated as AFI divided by OD600. Compared to the pCAS-ZE0 control group (N20 sequence lacked target site), approximately 350% and 340% fluorescence repression effects were obtained in groups ZE1 (N20 sequence targeted to the template strand) and ZE2 (N20 sequence targeted to the nontemplate strand) when the sgRNA associated with dCas9 binding to the − 35 position in the J5 promoter, on either DNA strand. Only a slight repression effect (138%) was achieved in the group ZE3 (N20 sequence targeted to RBS sites on the nontemplate strand). As for groups ZE1 and ZE2, similar repression effects were achieved by targeting different DNA template strands when dCas9 targeted to − 35 region in the promoter. This repression efficiency indicated that dCas9 exhibited no strand bias to − 35 region in the promoter. In case of group ZE3, the repression activity of dCas9 was significantly decreased compared to groups ZE1 and ZE2. These results demonstrated that a different dCas9-binding site (promoters or RBS sites) led to distinct repression of intensity. Because of the obvious fluorescence of eGFP, we could also observe transcriptional blocking by the naked eyes. Samples from each group were concentrated in respective 1.5-mL Eppendorf tubes and exposed to UV light. The results (Fig. 5c) were fully consistent with the RFI parameters. Altogether, these data demonstrate that dCas9 could be an efficient tool for gene repression in P. putida KT2440. We also endeavored to explore the feasibility of using FnCpf1 for genome editing in P. putida KT2440. We found that pCpf1-RK2K could only be transferred into KT2440 by conjugal transfer. Although we obtained dozens of clones by electroporation, pCpf1-RK2K could not be identified in these cells. After preparation of electrocompetent KT2440 harboring pCpf1-RK2K, plasmids pSEVA-gcR3361T, pSEVA-gcR5301T and control plasmids (pSEVA-gR3361T and pSEVA-gR5301T) were transformed by electroporation, respectively. Using the same procedure as for Cas9 genome editing, several random cells were picked from plates and tested by colony PCR. Using this CRISPR–Cpf1 system, we achieved deletion rate of 100% in PP_3361 (Fig. 6b), and PP_5301 (Fig. 6b). Thus, we preliminarily demonstrated that FnCpf1 can be harnessed as a genome editing tool in P. putida KT2440. In this study, we have demonstrated that a CRISPR/Cas9 system can be used for genome editing and regulation of gene expression in P. putida KT2440. A two-plasmid CRISPR/Cas9 system  was selected as our backbone because of the need for continual genome editing. In contrast to previous genome editing approaches [5–17] and a recently reported CRISPR–Cas9 method  (Table 2), our CRISPR/Cas9 system prove to be an efficient and fast tool in P. putida KT2440. The CRISPR/Cas9 genome editing system in P. putida is first developed by Aparicio et al. , in which gene deletion is performed by Cas9 protein assisting with single strand DNA (ssDNA) and a recombinase protein (Ssr) in a three-plasmid system. However, the genome editing efficiency in this approach has highly variable efficiency (13–93.2% below 5 kb target), gene insertion and replacement cannot be realized, and a plasmid curing strategy is also suboptimal. In our CRISPR/Cas9 system, genome editing efficiency reached more than 70%, and the total process including gene editing and plasmid curing could be achieved within 5 days (Fig. 7), which outcompetes most previous approaches in Pseudomonas. Owing to the high efficient plasmid-curing strategy, for continual genome editing, we can perform three rounds of genome editing in 1 week (Additional file 8). Besides gene deletion and insertion, transcriptional repression caused by dCas9 via different expression intensities of eGFP was successfully demonstrated in our study. In addition, we established another type II CRISPR system in KT2440, the CRISPR–Cpf1 system, which showed high genome editing efficiency. To establish a new genome editing approach in P. putida KT2440 via the CRISPR–Cas9 system, we first considered the transformation method for our plasmids. In our study, we applied two broad-host-range replicons for pCASsac function in Pseudomonas: pCAS-pBBR1 could not be transformed into hosts via electroporation, and the electroporation efficiency of pCAS-RK2K was low. Due to previous reports of Cas9 toxicity in several bacteria [30, 45, 50], we constructed five Cas9 protein versions that were transformed into P. putida KT2440 for toxicity analysis. There was no obvious difference of transformation efficiency between the five Cas9 versions, thus we could eliminate Cas9 toxicity as a major issue. In the next sgRNA construction step, we demonstrated Cas9 protein could be guided by sgRNA, which killed almost all the cells in the nicC plates. In the following procedures, however, we could hardly obtain any transformants from screening plates even with addition of donor DNA and the help of heterologous recombination proteins. Obviously, off-target effect of Cas9 was another challenge in this study, and could cause Cas9 to target other locations in the genome. Without a homologous repairing template, Pseudomonas cells could hardly survive multiple genome breaks. By means of CasOT, we could design sequence to avoid cells being cut by Cas9 at off-target sites. Finally (Fig. 2), transformants screened from plates showed a high knock-out efficiency. Due to the relative lower frequencies of native homology-directed repair system in P. putida KT2440, λ-Red-mediated recombination was essential for genome editing to proceed (Fig. 3). Additionally, we tried to simplify the construction of pSEVA-gRNAT plasmids, e.g. the homologous repairing arm supplied as a fragment was co-transformed with pSEVA-gRNAF (lacked the homologous repairing arm) into KT2440 harboring pCAS-RK2K. Although we could obtain dozens of transformants on plates, the mutation rate of target site dramatically decreased to 10%. In previous other genome editing methods , we found donor DNA was inserted into plasmids, and we assumed this phenomenon might be correlated with a lower efficiency of DNA uptake in P. putida KT2440. After the preliminary establishment of the CRISPR/Cas9 system, we attempted different genome editing approaches in P. putida KT2440. We showed that an N20 sequence could obtain a similar high mutation rate irrespective of the target DNA template strand, and the efficiency of fragment insertion was not affected by the length of the fragment (within the range we tested). In addition, we developed a single nucleotide mutation approach for different target site conditions. A One-step method could be performed if the desired site is in a PAM motif or the last 12 bp of the N20 sequence near a PAM region . However, not every nucleotide satisfies these requirements, and for those we developed a two-step strategy. We designed a high-specific 20-bp sequence (A20 sequence) between the N20 sequence and PAM motif, which could avoid the degradation of donor DNA. After the first step, single nucleotide could be mutated and the A20 sequence left in the genome. Then, in the next step, we changed N20 sequence to this A20 site, and then A20 sequence was eliminated from homologous repairing template. By this method, we could obtain a scarless single nucleotide modified strain. Cas9 can be guided by multi sgRNAs, and multi-gene editing performed by CRISPR/Cas9 is a unique feature compared with other genome editing tools. In our study, we also attempted to perform a double-locus editing experiment, but could not obtain a strain with double-locus deletion after we picked more than 100 transformants in one experiment. Although gene deletion simultaneously performed in two sites was successfully demonstrated in a recent study , the editing efficiency of this method was extremely low (0.5%). In our study, we do not recommend this method because of its low efficiency and time-consuming plasmid construction. Instead, we tended to perform multigene editing by multiple rounds, achieving genomic mutation in a single target site in each round. This approach was highly efficient, and the manipulation time was reduced via the flexible and efficient curing strategy in our two-plasmid system. CRISPR interference is an alternative approach to gene knock-out for regulation of gene expression and has been widely used in bacteria such as E. coli  and Clostridium . Here, we selected eGFP and tested different dCas9 binding sites as target sites for CRISPRi. Different dCas9 target sites had a significant impact on the level of transcriptional repression, but the DNA strand on which an N20 sequence was located had no obvious effect on dCas9 blocking of gene expression. When dCas9 targeted to the starting region of promoter, this repression effect was much better than RBS sites. The exploration of pCAS-ZE systems could be a useful approach for metabolic engineering regulation and other genomic manipulation in P. putida KT2440. The CRISPR–Cpf1 system is an emerging Type II CRISPR genome editing tool, which has also been established in several organisms [45, 55, 56]. Due to its longer target sequence (23–25 nt), Cpf1 exhibits relatively low potential for off-target activity, creating applicability of CRISPR–Cpf1 as a complementary genome editing tool to CRISPR–Cas9 system . The establishment in the study of the CRISPR–Cpf1 system in strain KT2440 will be an alternative tool for some gene loci, for which it is hard to obtain a non-off-target N20 sequence. Here, high efficient and versatile functions CRISPR/Cas9 system have been successfully established in P. putida KT2440. Although off-target effects of Cas9 are a challenge in target locus selection, versatile gRNA selection tools [42, 57, 58] and an enhanced-specificity mutant version of Cas9 have been developed ; these tools can minimize off-target effects and increase on-target possibilities. Besides P. putida, there are abundant Pseudomonas species, such as P. aeruginosa, a commonly used strain in immunology , and P. fluorescens, which possess growth-promoting ability for host plant . Currently, we are trying to extend the CRISPR/Cas9 system and the CRISPR/Cpf1 system into P. aeruginosa PA01 and P. fluorescens Pf0-1 in our laboratory. P. putida KT2440 is a well-known “generally recognized as safe” (GRAS) bacterium, a versatile platform in biotechnology , and an important next generation synthesis biology chassis . Although the complete genome of P. putida KT2440 was sequenced  and revisited , and a set of bioinformatics tools [66, 67] was also developed, the practical biotechnological methods for predictive verification and modification of these chassis cells are suboptimal. Thus, the establishment of CRISPR–Cas9 and CRISPR–Cpf1 systems in strain KT2440 will spur and facilitate further understanding and application of this strain, and form the basis to extend CRISPR genome systems into other important Pseudomonas strains. JW, SY and JS designed the experiments. LY, YJ, QW, ZW and JS participated in the discussion about the experiments. JS performed experiments and drafted the manuscript. All authors read and approved the final manuscript. We would like to thank Esteban Martínez-García for providing the pSEVA plasmids. We also thank Pei Lei (from Huazhong Agricultural University) for kind donation of P. putida KT2440 and Escherichia coli S17-1. All supporting data is present in the article and the additional files. pCAS-RK2T, pSEVA-gRic6T and pCAS-ZE3 are available on Addgene (under the Numbers 106400, 106401 and 106402) and GenScript (under the Numbers MC_0000261, MC_0000262 and MC_0000263). This work was financially supported by the National Natural Science Foundation of China (No. 21676240). 12934_2018_887_MOESM1_ESM.docx Additional file 1. The strains and plasmids used in this research. 12934_2018_887_MOESM2_ESM.docx Additional file 2. Key primers used in this study. 12934_2018_887_MOESM3_ESM.bmp Additional file 3. The construction strategy of pCAS-RK2K and pCAS-pBBR1. 12934_2018_887_MOESM4_ESM.docx Additional file 4. PAM-guide sequences used in related plasmids. 12934_2018_887_MOESM5_ESM.bmp Additional file 5. Plasmids of two-step single nucleotide mutation strategy. 12934_2018_887_MOESM6_ESM.jpg Additional file 6. The total CFU calculation from different Cas9 versions. 12934_2018_887_MOESM7_ESM.docx Additional file 7. The analysis of sgRNA off-target in KT2440 by CasOT. 12934_2018_887_MOESM8_ESM.bmp Additional file 8. Flow-chart of 3 rounds of continual genome editing in P. putida KT2440.